Harborview Medical Center, 325 9th Ave.
Join Molly and Jeramy Hale at the Harborview Medical Center in Seattle for a 2-hour aikido seminar on Recreation and Re-Creation after SCI. 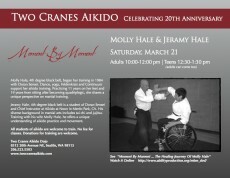 Join Molly and Jeramy Hale at Two Cranes Aikido in Seattle for this half-day seminar. 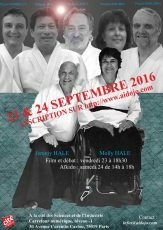 The Center hosts a one-day seminar with Jeramy & Molly Hale, both 4th dan, from Aikido West (CAA Division Two). 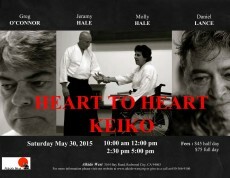 Join us for a one-day seminar at Aikido West with instructors Greg O'Connor, Jeramy Hale, Molly Hale, and Daniel Lance. Feather River College, 570 Golden Eagle Ave.